It's easy to lose count of the number of times the NHS has been reorganised in the last decade, with shifts occurring on at least an annual basis, but two recent developments promise to be particularly significant for pharma in 2017. The new care models, that will be provided by NHS vanguards and the Sustainability and Transformation Plans (STPs), are already subject to huge local variety and there's a fair bit of myth and legend about what's actually happening. So, late last year, these important changes were put under the microscope at a roundtable meeting organised by healthcare intelligence provider Wilmington Healthcare. The event was presented in association with PharmaTimes and held at The King's Fund in London. Both vanguards, of which around 50 exist so far, and STPs, which see local health and care systems divided into 44 areas (or 'footprints'), are about having one plan for an area to provide place-based care. The implications of these changes are huge, as Sue Thomas from Wilmington Healthcare told the meeting. "We've certainly had a bomb dropped on the NHS in terms of the way in which services are being delivered and vanguards are really being seen as the way forward in terms of throwing away the rule book and trying to start to design new models of care," she said. However, to date, it's been very difficult for pharma to engage with vanguards, who are not primarily concentrating on particular therapy areas but on generic themes like mental health and making their finances work. With some 70% of Trusts thought to be running at a deficit at the moment, this focus is to be expected. But with vanguards prioritising making a difference in terms of what's being spent and patient outcomes, there is, said Craig Bradley from Shire, a 'real opportunity for pharma to get involved'. "The challenge is getting together all of the different bodies that are involved." Questions about whose budget is involved and where any savings go have often caused projects to stall in the past, he added. For the NIHR's Sine Littlewood, vanguards and STPs present opportunities, thanks to their ability to bring players together across organisational boundaries. "I think that people who are involved in the vanguards are wanting to take that opportunity and, from a research perspective, what's really good is that they're building in the evaluation of the vanguards at the same time." She added: "For me, from a research perspective, that's really important and the NHS is keen to find out what works and what doesn't." However, vanguards' complexity should give pharma pause for thought, said David Garmon-Jones, whose current roles span the NHS, third sector and consultancy. "All the vanguards are going to be different and pharma will need to work out what matters most to each of them. There are five different subtypes of vanguards and they all have different sizes and challenges. You can even interact with vanguards without even realising it – for example, if you sell anything to the Isle of Wight that whole area is a vanguard." 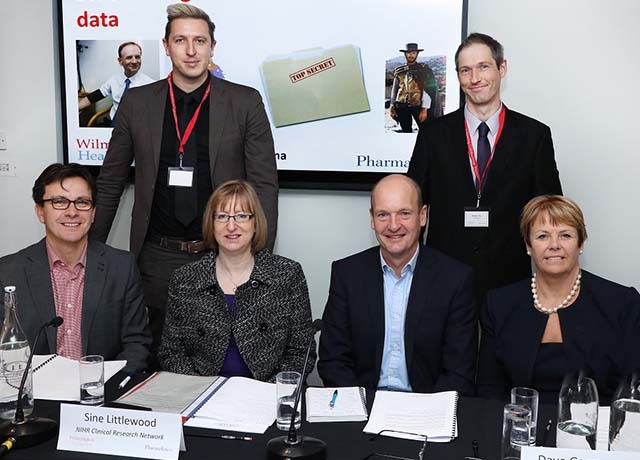 How pharma could get involved was a key question tackled by the roundtable. Sue Thomas noted that "the majority of vanguards that we've worked with are looking to put risk stratification into place", adding that there was also "an increasing focus to move services into primary care and a real shift from just providing treatment to prevention". Looking at what Shire is doing in this space, Craig Bradley said: "From a market access field force point of view, I believe joint working offers pharma a real opportunity to engage with STPs and vanguards to wrap things around joint working in a very transparent manner." There have been successes with this approach in the past, with areas such as stroke having been transformed over the last ten years. "Pharma has been instrumental in helping with that and can do the same sort of thing in other areas," Sine Littlewood said. "Prevention is one of the key things that Professor Chris Whitty, the chief scientific advisor, Department of Health, is emphasising because of the links with the ageing population and the multiple co-morbidities that people have." But to take up these opportunities, pharma companies will have to go beyond pointing out the issues. "Vanguards want solutions from pharma, not problems, and they want support," said Sue Thomas. In pursuit of this, getting the right data, and making use of it in the right way, will be vital. "From a pharma point of view," Craig Bradley said, "if we can package the data up effectively and correctly put our value proposition together then that's an opportunity for us as well." Roundtable speaker Paul Midgley, of Wilmington Healthcare, also works with the Principia MCP Vanguard in Nottinghamshire, where they're trying to focus their spending on prevention and early intervention ("which is a massive mindset change", he noted). "What we've realised by looking at the data on the population is that people with multiple long-term conditions – and people over the age of 65 – tend to have more than two long-term conditions. That is a real 'problem' sector of the population and their journeys through the NHS are complex, often accessing various providers," Paul Midgley explained. David Garmon-Jones, who previously spent 32 years at Merck Serono, noted the theme of 'the changing NHS' had been discussed for many years. He added: "I am sure the NHS can learn from pharma when it comes to implementing change and if vanguards are to work, there's a clear need for change management." Expanding on this point, Paul Midgley said: "Pharma's super key account managers often have PRINCE2 training, so they can help with project management, for which the NHS has limited resources."